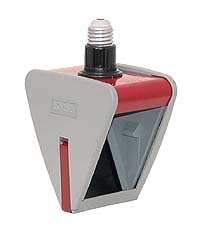 The Kodak 2-Way Safelamp is a small, versatile safelight that can be screwed into any convenient wall or ceiling lamp socket, or may be used with a socket and clamp set to allow adjustable positioning. The 2-Way Safelamp accepts 3¼" x 4¾" filters (not included) of different types to accommodate different photo materials - refer to the product data sheet packed with the material you are using to determine the recommended safelight filter for that specific material. The safelight can be rotated on it's socket for best positioning, and when used as a ceiling light, or when a broad area of coverage is required, a second filter can be added by replacing the blank plate on the opposite side. Safelight is approximately 7½" x 5" x 4". These safelights are used and have minor cosmetic scrapes and scuffs, but are clean and certified to be in in perfect working condition. Each safelight includes a standard 15W 130V frosted lamp, blank plate, and a copy of the Kodak publication "How To Use Kodak Safelights".